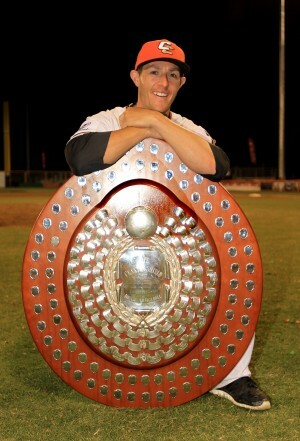 Less than a week ago I was pacing my bedroom, anxiously begging for the Canberra Cavalry to make the last out of game two of the ABLCS to clinch the first ever Claxton Shield for the Australian Capital Territory. Cue a knocked down ball by closer Sean Toler and an underhand toss (looking at you Mr.Foulke [2004 Red Sox]) toss to Aaron Sloan and it was all over. Now it’s a warm Wednesday night and I’m absorbed by the fact that Spring Training has kicked off in the States. As a Red Sox fan, I’m devastated by the news John Lackey is healthy, so right now I’m focused on the Australian connection. The main player in said connection right now is the man of the moment, Michael “Tubby” Collins. When I spoke with Collins shortly after his appointment last year, he said the one of the most exciting prospects of the job was the Canberra fan base, who he rewarded in spades on Saturday night. Not only is Collins receiving well deserved accolades from the Australian baseball public after his efforts as a first-year manager, but he is also making waves within the San Diego Padres organisation. After managing the Dominican Summer League team in the Padres organisation, Collins has in the last fortnight helped ABL Triple Crown winner Adam Buschini ink a deal, while Brodie Downs will head to Peoria, Arizona to link up with the Padres organisation as they head into camp. While neither Buschini or Downs will get near Petco Park this year (fortunate circumstances aside), the work Collins has done to get them back into, or with a real at joining an affiliated organisation. Honestly, not a lot more than what is being done now. Pick a team, get to a game, buy merchandise, grow the addiction and then feed it more. With pitchers and catchers reporting within 48 hours of the end of the ABL season and the ABL opening little more than a week after the end of the World Series, it truly is a game that never ends. This entry was posted in Published on xavierplayer.com, Written and tagged ABLCS, Adam Buschini, Brodie Downs, Canberra Cavalry, Keith Foulke, Michael Collins, Spring Training. Bookmark the permalink.